Beulaville, NC Bojangles'® Tands, INC. Store #43 - Bojangles'® / Tands, Inc.
For a convenient and delicious option for breakfast, lunch, or dinner, choose Bojangles’® in Beulaville! We are located near East Duplin High School and make a great hangout for Beulaville students after school or to get together for a Panthers game. We love being a part of the Beulaville, NC community and showing our support for East Duplin HS! Nothing beats the crispy, spicy Bojangles’® fried chicken, freshly made buttermilk biscuits and the tasty fixin’s you won’t find anywhere else, like our Dirty Rice® and Cajun Pintos®. 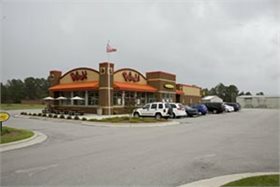 For friendly, fast service with an affordable meal in Beulaville, NC, you can’t beat the food at Bojangles’®!